Today, I'd like to share one of my all time favorite cards! Inspired by a picnic in the park and a fun game of Scrabble, this thank you card is so cute! 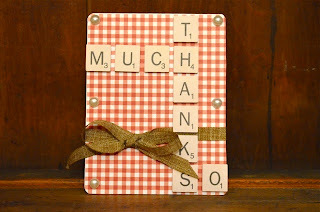 I used a gingham paper from The Paper Studio and thin paper Scrabble tiles from American Crafts. I love being able to use foam adhesive to add dimension to the card in order to give it the look of a real Scrabble tile without all the weight. It's a unique way to add a sentiment to a card without the use of stamps. It would even be cute to personalize a card by using the tiles to spell out the recipient's name or initials! I bought the Scrabble tiles from Hobby Lobby a few months ago and I believe they were made by American Crafts. I don't think they are available anymore, but you can find printable tiles online to use for this technique.